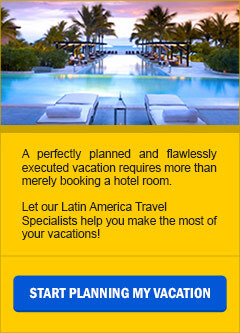 As a full-service Destination Management Company and Tour Operator / Wholesaler specialized in Latin America since 1989, EcoAmerica Tours focuses on a small part of the world: Central and South America, featuring only selected countries such as Argentina, Belize, Brazil, Chile, Costa Rica, Ecuador and The Galapagos Islands, Guatemala, Panama, and Peru, and are not distracted promoting, marketing and selling a diverse mix of other places. Our Mission: As a Destination Management Company, for all of us at EcoAmerica Tours our mission is to create and deliver extraordinary experiential journeys in Latin America through tailor-made itineraries filled with real activities and features, taking care of every detail to provide our guests with enriching and inspirational travel experiences. Knowledge. Knowledge is what makes us different and stand out in our area of expertise; it is what gives us all the necessary elements that a true destination specialist has to have. We concentrate our efforts in only a small part of the world in order of being able to provide our clients with the best possible advice and recommendations. Whenever we suggest a destination, a hotel, an attraction, is because at least one of us or our local partners have been there and have done that! Our Vision: Our Vision is to strive to provide the finest of experiences to become the Latin America Specialists Preferred Supplier while fervently sharing our commitment to excellence in the delivery of services. Our vision focuses in our continuous search of excellence while staying true to our core values: by letting integrity rule the way we do business, our knowledge combined with our passion and enthusiasm will keep on building stronger bonds and confidence between us and our clients. Thanks for your interest in our company and its services. 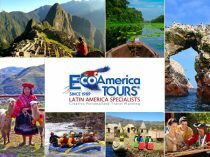 All of us here at EcoAmerica Tours appreciate the opportunity to assist you with the planning and implementation of one-of-a-kind Holiday Adventures. We are ready to make your vacation planning and reservation process really smooth and easy. As a Destination Management Company, for all of us at EcoAmerica Tours our mission is to create and deliver extraordinary experiential journeys in selected countries in Latin America: Belize, Guatemala, Costa Rica, Panama, Ecuador, Peru, Brazil, Chile, and Argentina. We understand that no two travelers are alike and that is why we take the time pre-designing interesting, fun, and attraction-filled holiday adventures featuring real activities and attractions to offer almost endless travel choices for first-time visitors and unique off the beaten path, discovery itineraries for repeat travelers. After 25 years of planning and executing vacation programs to our well selected destinations, we certainly are specialists and know first-hand what works best taking care of every detail to provide our guests with exceptional, enriching, and inspirational travel experiences and the best part, with no hidden fees! Our commitment to provide our guests with real value and personalized service is what motivates us to always apply our knowledge, resourcefulness, and strengths at each level of our operation, always focused on the delivery of services above and beyond the call of duty. On behalf of the EcoAmerica Tours Team, we wish you an enjoyable journey! As a full-service Destination Management Company and Tour Operator / Wholesaler specialized in Latin America since 1989. 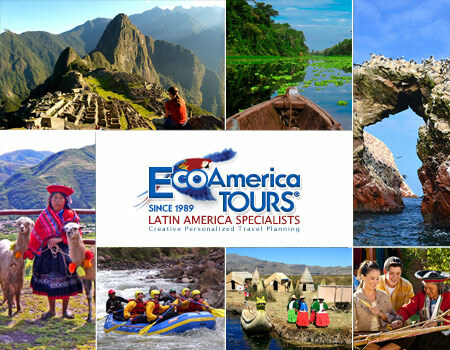 EcoAmerica Tours focuses on a small part of the world: Central and South America, featuring only selected countries such as: Argentina, Belize, Brazil, Chile, Costa Rica, Ecuador and The Galapagos Islands, Guatemala, Panama, and Peru, and are not distracted promoting, marketing and selling a diverse mix of other places. After more than three decades of planning and executing Latin America Tours, we certainly are specialists in each one of these exciting destinations and know first-hand what works best to provide our guests with exceptional vacation experiences. Our Vision is to strive to provide the finest of experiences to become the Latin America Specialists Preferred Supplier while fervently sharing our commitment to excellence in the delivery of services.